‘Mrs May! Mrs May! Over here!’ Don’t you just want to put your hand in the air in a plea for attention, like the annoying child at school who knows their 12-times table and will not stop jumping up and down until the teacher takes notice? The prime minister wants to sort out the ‘burning injustice’ of the pay gap between men and women, and to rectify the sexism that means women earn less than men for comparable jobs. This was brought to everyone’s attention earlier this year when one of the most senior journalists at the BBC downed tools in protest about the unfairness of it all. Good on Theresa May for her determination to bring about a sea change, but I hope she acts beyond like-for-like remuneration. Nurses have always been poorly paid because ours is, by and large, a female workforce. Think of our so-called equivalents in the public sector with whom we are often aligned – the police, the fire service, both predominantly male. Their unions are more forceful, which may play a part, but we are the least valued because our job is traditionally female. No one will admit to this of course, but it is demonstrably true. And how about this for a burning injustice? 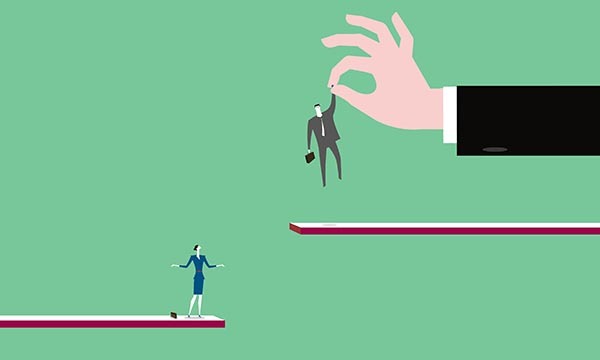 In March, early findings from research carried out by a professor at London South Bank University showed that men are favoured in nursing when it comes to promotion. The glass ceiling is so low for women that we are in danger of bumping our heads, but it doesn’t exist for our male counterparts. Although we love them and wish them well, the unfairness rankles. Over here, Mrs May, over here.